Chad Johnson and Brian Elliott would probably testify that it isn’t easy to be a goalie for the Calgary Flames. After all, only nine goalies have played more than 100 games for the Flames since they came to Calgary in 1980 and the team has missed the playoffs in 14 of the 36 seasons they have been in the NHL. During their history, the Flames have advanced to the Stanley Cup three times thanks to Mike Vernon, a rookie in 1986, who then became an established veteran in 1989 when they won the rematch with Patrick Roy and the Montreal Canadiens. All was quiet and looking a bit bleak for the Flames and their playoff hopes until 2004 when their underdog squad lead by Miikka Kiprusoff came within one goal of winning it all again. So, who was better? Vernon or Kiprusoff? How good would Reggie Lemelin have been if he didn’t have to play Gretzky and the Oilers so regularly in the early 1980’s? What about short-term standouts like Roman Turek & Fred Brathwaite? The debate will no doubt be furious but here are my picks — from number 10 to number one — for the all-time best goalies to ever wear a Flames uniform since 1980. As a past winner of the Vezina trophy in the 1979-80 season, you might expect Don Edwards to hold a spot higher on this list of Flames goalies. However, Edwards couldn’t outplay Reggie Lemelin to win the number one job during their early seasons in Calgary. In his career with the Flames, Edwards played in 114 games but only won 40 of them to go with a 4.06 goals against average (GAA). After leaving the Flames following the 1984-85 season, Edwards would play just one more year in the NHL with the Toronto Maple Leafs before retiring. Seeing Ramo’s name on this list in the number nine spot could be a sore spot for some fans considering the team’s fortunes at the goal position this season. Ramo could still be on the team but instead, is toiling in the American Hockey League (AHL) with the Toronto Marlies after being released last year. Ramo’s inconsistency in net was the biggest factor that kept the Flames from re-signing him. However, the torn ACL he suffered at around this time last year also played a role in his demise with the team. Since Ramo was out of the picture, the Flames had to rely solely on Jonas Hiller and Joni Ortio and the below-average performance from all three that season caused a complete overhaul in the Flames goal. Surprisingly, Ramo really wasn’t that bad of a goalie according to the stats. He ranks second in Flames history in save percentage (.911%) behind only Miikka Kiprusoff (.913%) among goalies who have played more than 100 games for the Flames. Less impressive though is his record of only 49 wins in 111 games and his unique ability to give up soft goals at the worst possible time. However, Johnson and Elliott know a thing or two about doing that this season as well. This acrobatic goaltender was part of the Flames organization just as they were selling off the last of the stars from their Stanley Cup victory in 1989. Tabaracci was a journeyman goaltender who had a couple of solid years in Calgary where he posted a goals-against average under 3.00 while playing in more than 40 games each season. Wamsley was the other guy in net for the Calgary Flames behind Mike Vernon when they won the Stanley Cup in the 1988-89 season but he was known throughout his career as one of the most dependable back-up goalies in the NHL. He also holds the distinction of being traded for Brett Hull when the Flames acquired him from the St. Louis Blues along with defenseman Rob Ramage. As lopsided as that trade may appear, both Ramage and Wamsley had key roles on the ice and in the dressing room that led the Flames to their Stanley Cup win. In his career with the Flames, Wamsley played in 111 games posting 53 wins over parts of four seasons with a 3.21 GAA. Trevor Kidd is probably the most disliked goaltender in Flames history. After being selected 11th overall in the 1990 NHL Entry Draft, the expectations placed on Kidd to be the second coming of Mike Vernon were very high. Like many Flames prospects, Kidd was expected to play beyond his skill set and was constantly scrutinized for his poor performances in big games. Kidd’s days were numbered when the team was swept by the Chicago Blackhawks in the 1995-96 playoffs. He ranks fourth among Flames goalies in games played at 178 with a 2.83 GAA and a lower than average save percentage at .898% and 10 career shutouts. The goalie nicknamed “Large” is one of three eccentric European Flames goaltenders in Miikka Kiprusoff and Karri Ramo who love heavy metal music. At 6’3″ and well over 200 pounds, Turek used his body positioning to make saves. His height helped him to cover much of the net with his huge torso and he had quick feet but his problems with puck handling and rebound control often left him open for weak goals as players crashed the net. Turek ranks fifth among Flames goalies in games played with 152 with a 2.53 GAA and a .906% save percentage. Surprisingly, he also ranks third in franchise history behind Mike Vernon with 12 shutouts during his short three-year career in Calgary. After playing 40 games earlier in his career with the Edmonton Oilers, Fred Brathwaite came to right side of the Battle of Alberta and brought stability to an extremely young team. During the three seasons that Brathwaite played for the Flames it was the young tandem of Derek Morris and Robyn Regehr that headlined the defensive core of the team. Needless to say, the Flames were abysmal over these seasons but Brathwaite played spectacularly achieving a .909 save percentage that ranks him third among Flames goalies. He played in 138 games for the Flames posting a 2.54 GAA with 54 wins and 11 shutouts in front of some very poor Calgary Flames line-ups over three seasons that never even came close to making the playoffs. Reggie came to the Calgary Flames organization from Atlanta when the team was relocated in 1980. By the 1983-84 season, Lemelin had won the starting goalie job over Don Edwards to become the Flames goalie tasked with trying to stop the Edmonton Oilers of the early 1980’s as they won four consecutive Stanley Cups. It was probably the toughest job in hockey at the time and while Lemelin couldn’t lead the team past the Oilers he played solidly over 303 career games in a Flames uniform. During his career in the goal-ridden 1980’s, Lemelin posted a career 3.67 GAA with six shutouts to place third on the all-time wins list among Flames goalies. 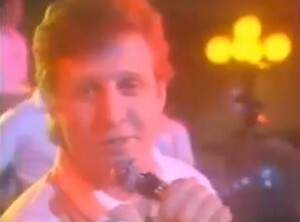 Mike Vernon, channeling his inner Huey Lewis with the rest of the Calgary Flames in a cheesy promotional video in the 1980’s. Mike Vernon is the only Flames goalie to have his number retired by the organization. He is also the goalie best known for helping the Flames to become one of only two teams, along with The New York Rangers in 1928, to win a Stanley Cup on Montreal’s home ice. Vernon was an extremely quick goalie who made up for his lack of size at just 5’9″, with an incredible glove hand and a compete level that may have only been surpassed by Patrick Roy. Vernon achieved 262 wins over 526 games as a Flame while racking up a surprising 192 minutes in penalties. There can be no debating that Miikka Kiprusoff is the best goalie in Flames history. Kiprusoff played with an eerie calmness in net. He also was incredibly consistent performing at an elite level right up until his decision to retire as a Calgary Flame. Kiprusoff is the franchise leader in wins (305), shutouts (41) and games played by a goaltender at 576. 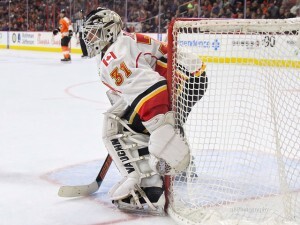 He is Darryl Sutter’s single best acquisition as Flames general manager when he was obtained from the San Jose Sharks for just a second round draft pick and will probably be known as the most acrobatic and athletic goalie in Flames history for many years to come. 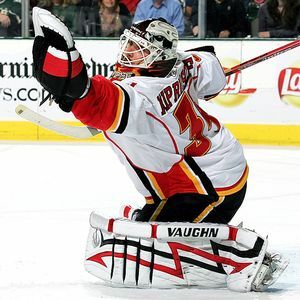 Selecting Kiprusoff and Vernon as the top two goalies in Flames’ history is a very easy task as both have records that are far superior to their colleagues. After that though, the drop off is significant which highlights just how difficult it is to be a successful goalie in the NHL. This season is no exception and as both Chad Johnson and Brian Elliott struggle to find their way as Calgary Flames goalies, it’s important to step back and get some perspective on how rare and exceptional a Hall of Fame calibre goalie is in any organization. However, with Jon Gillies and Tyler Parsons coming up as hot goalie prospects in the Flames system it’s encouraging to think that one or both of them could one day crack this same list.